Lemongrass is a tropical plant that freezes to death where winter temperatures drop below 15F (-9C). In all climates, potted plants are easy to keep through winter indoors. Start with a purchased plant in spring, and grow it in a pot until the soil warms in early summer. You can also root a stalk from the produce market in water. 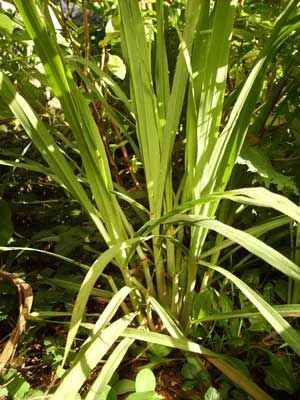 Plant lemongrass in a warm, sunny spot that is convenient to water. In late summer, dig away an outer stalk, cut back the leaves to 3 inches (8 cm), and plant it in a small container. Grow it through winter in a sunny windowsill, providing only small amounts of water, and replant outdoors the following spring. Leave the plant to develop some thick stems before starting to harvest. The most tender leaves are found close to the stems. Plants may rot in poorly drained clay soil. When lemongrass is grown in containers, shift the plants to larger pots as needed. When the roots become crowded, they can cause clay pots to crack.